it's about what you do after the fall." I am sad yet pleased to inform you all that this has become my new favorite book. Yes, this has pushed into first place, leaving Pushing the Limits by Katie McGarry as very very close second. Maddy Spier's been in love with the boy next door forever. As his figure skating partner, she spends time in his arms every day. But she's also seen his arms around other girls-lots of other girls. How can she make him realize that they can be partners off the ice as well? Gabe's relationship with Maddy is vital. he can't imagine skating with anyone else, and together, they have a real chance at greatness-maybe even making it to the Olympics someday. So he's decided to think of her as a sister. After all, family is forever, and he's never dated anyone for more than two weeks. Then their coach assigns a new romantic skating program, and everything changes. Will this be the big break that Maddy's been hoping for or the big breakup that gave has always feared? Find out, as this intensely romantic novel sweeps you off your skates! Okay, now, I know that I am a gently critic. I focus very much on the positive and not the negative. I promise from now on to even it out, to have good and bad things to say about books to come. BUUUUUTTTTTTT.... I only have good things to say about this one. When I picked up this book, I thought I was getting into another sappy romance story, I mean the title is The Boy Next Door for goodness sakes! We all can pretty much speculate the plot line to a book with a title like that. Honestly, it wasn't what I expected. Of course there was the definite romance theme throughout the book, and Maddy and Gabe's relationship was an extremely large portion of the book, but it was so much more. Van Ark had so many other things in the novel, family, friends, misunderstandings, skating, she did an incredible job of not making the entire book only the romance. A good book always has that balance, to keep you lusting for more of each element. Fact: I know absolutely nothing about skating! Nada, none, nothing. Fact: Van Ark wrote the entire book in a way that, I didn't need to know what all the terms meant, I didn't need to understand exactly what Gabe and Maddy were doing. She made the skating terms, literally skate through the story and it didn't make the reader struggle. She described everything in a way that made the reader understand, made the reader see the entire routine in their mind. It was amazing. Fact: I know what a triple axel is and the quad throw thing. Maddy and Gabe live next door, they've been skating since they were six and ever Saturday their families do dinner, games and movies. Maddy's dad is the Senator for Kansas and he has a secret. There is so much of the family element in this book, that at times it felt like two separate books. She kept the balance nicely and didn't flood the book with only romance. It had the scandalous drama of having a senator as a father. It had the strictness of the skating instructor. It had the anxiety of a skating competition. It had the monotonous lull of high school. It had everything there to surround the romance. But boy did she build the sexual tension between Maddy and Gabe through the entire book, even after they got together (Spoiler alert! but if you didn't see that coming, clearly you need to read more.) I think what my favorite thing Van Ark did in this book, was she let us read about the actual relationship, we got to see them AS a couple. One of the most annoying things to me, is that more often than not, authors will spend the entire book having the character's chasing after each other to get to that relationship and as soon as they are a couple, the book ends. Not in The Boy Next Door, Maddy and Gabe got together towards the middle of the book and then the rest of the time we got to read about them AS a couple. It was great, it quenched the thirst for sure. Something else that made me smile about this book was that it is told from Maddy and Gabe's viewpoints. Each chapter switches between who's mind we are in. It gives us more drama to know what the other character doesn't, it's like a little secret between the character and the reader, and it is a good secret. For the longest of time, four years now, Pushing the Limits by Katie McGarry has been my favorite book, read my review to understand why. 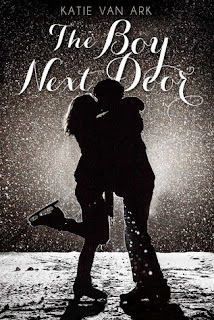 But today, January 12, 2016, The Boy Next Door by Katie Van Ark, has pushed it's way to my #1 favorite book, and I highly highly recommend this book to anyone and everyone. This book is different than other books. 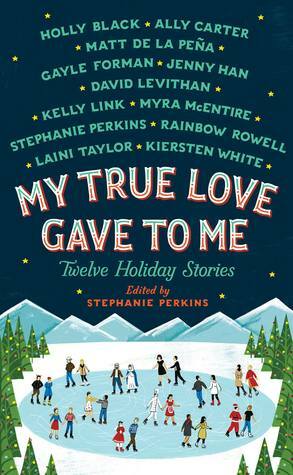 It is actually twelve holiday short stories written by twelve different authors. I love books like this, they are so light and easy to read because you'll just read one story a day and then you have something new. The pace is always consistent, there are no drags in the story because they are different stories each time. I actually read this in early December, finishing it before Christmas, but with the holidays and the new year, I didn't get around to posting it yet, so here it is now. Reviewing every single short story would take a long time, so I will review it as a whole and then pick out a few honorable mentions. As a whole: Every short story really just made me feel all warm and fuzzy on the inside, each one was filled with the holiday spirit and the magic that is Christmas. Holly Black, Ally Carter, Matt De La Pena, Gayle Forman, Jenny Han, David Leviathan, Kelly Link, Myra McEntire, Stephanie Perkins, Rainbow Rowell, Lani Taylor, and Kirsten White, all wrote their own short story and added it into the over all book. It was extremely fun to read each one, every author has their own writing style, their own little niches and ways of wording things. Each little story was a like a sneak peek into how that author writes, how they develop characters, how they make you feel while reading their story. For the author's I've read before and love already it was refreshing, and for the ones I haven't read, it was snack to hunger me for more. Because of the size of each story it was easy to read through the book without any dull moments, you didn't get tired of the characters because you saw them for so brief. I highly recommend this book and other short story collection books to anyone who maybe doesn't have the longest of attention spans. This one in particular was fun, light, fluffy, entertaining, magical and had that holiday spirit everyone looks for during the holidays. - Her story reminds me of this hilarious Christmas song! I don't know if I have fully expressed my love for Gayle Forman. I love her writing style, I love her books. 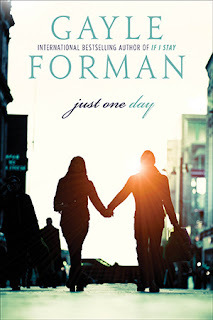 I have a previous review for If I stay and Where She Went, which are also written by Gayle Forman. I just, the way she makes you feel about these characters is incredible. You get attached to them and you laugh at their jokes, smile at their fortunes, and cry at their sorrow. That being said, Just One Day was different for me. Allyson Healey's life is exactly like her suitcase- packed, planned, ordered. Then on the last day of her three-week post-graduation European tour, she meets Willem. A free-spirited, roving actor, Willem is everything she's not, and when he invites her to abandon her plans and come to Paris with him, Allyson says yes. This uncharacteristic decision leads to a day of risk and romance, liberation and intimacy: twenty-four hours that will transform Allyson's life. A book about love, heartbreak, travel, identity, and the "accidents" of fate, Just One Day shows us how sometimes in order to get found, you first have to get lost... and how often the people we are seeking are much closer than we know. Part one: The first part of the book had me hooked. First we meet Willem (I love this derivative of William, it is somehow much hotter, especially after you get to know Willem), an actor who is playing Sebastian in a rendition of Shakespeare's Twelf Night. This rendition is kind of a make shift performance, where they actors come out from the crowd and act in the park, no stage, no music, no fancy lights, just nature and the actors themselves. It was a very fun beginning to the book, it grabbed you and made you want to learn more about mysterious Willem. When he and Allyson meet he calls her Lulu, the name of a french actress, he not once asks her name, and in a way is alluring. Allyson has this new identity that she can be, it's kind of like a pardon from everything that happens in Paris, it wasn't Allyson, but Lulu who did it. As the novel continues Willem has all these quarks that Allyson/Lulu enjoys (Me too! Not just Allyson), he believes that accidents are a driving force in the universe and the accidents are what makes life worth living. I enjoyed the first part of the book and all the romance Lulu and Willem have and the thrill of it all. When I got to part two of the novel, I had a really hard time getting into it. I felt betrayed by Willem, this character not only Lulu but myself as well, had fallen in love with. However, as I continued to read on, which was not entirely easy for me, I found that like Allyson, I wanted to find Willem again. I wanted to reunite with him. (If you can tell I really was able to put myself into Allyson's shoes) When we do find Willem, my heart shatters even more. Well, what could the reader really expect from a girl who goes back to America and a boy that stays in Europe? They have their own lives. At the end of the book Forman left with a cliff hanger. Allyson and Willem finally being in the same room, about to have a conversation and end book. Why do you make me suffer so much Gayle Forman? All I want is to know what happened, in the same book, not a sequel!!!! But a sequel it is, and one I have to read soon. All in all, this book was very entertaining, Forman's character development and relateableness is astonishing! I love reading her books and empathizing with the characters. She did it again! A definite must read.